Motorcycle accidents often involve severe injuries. They require experienced lawyers who are aggressive and skilled in the unique issues involved in motorcycle accidents. For over 30 years as motorcycle accidents attorney, the Motorcycle Accident law firm/Office of Mark A. McLaughlin has handled to successful conclusion countless motorcycle accident cases. We know how to effectively deal with the bias that motorcyclists and their passengers often experience from law enforcement investigating the accident as well as from juries and insurance adjusters. If you are a motorcyclist who has sustained serious injuries in a motorcycle accident, please contact the Law Office of Mark A. McLaughlin to obtain a maximum cash award for your injuries, medical bills, pain and suffering, loss of wages, motorcycle repair, protective motorcycle gear repair, and all other related costs and expenses. As motorcyclists who have been injured in motorcycle crashes themselves, the Law Office of Mark A. McLaughlin knows from personal experience what an injured motorcyclist goes through. Over 2,500 motorcyclists are killed each year and another 50,000 are injured. More than 80% of all motorcycle accidents result in injury or death. Many of these accidents are not the fault of motorcyclists but instead are the fault of inexperienced, inattentive, or reckless drivers. 75% of all motorcycle accidents involve automobiles. Unfortunately, most motorcycle accidents occur because the automobile driver does not see the motorcycle. 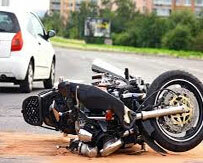 We are experts at presenting a motorcyclist victim's case to the insurance adjuster and the jury. We are extremely aggressive at representing motorcycle accident victims. We have recovered millions of dollars for motorcycle accident victims. We fight very hard for our clients' rights and are afraid of nobody. The Law Office of Mark A. McLaughlin will aggressively fight for you. It is our duty to recover the maximum cash award for you. If you or a loved one has been injured or killed in a motorcycle accident, please immediately call the aggressive motorcycle accident Law Office of Mark A. McLaughlin for a free consultation. You need to know your rights! Contact our office today to discuss your car accident injuries. We are available during regular business hours and by appointment evenings and weekends. You can reach us by phone at (925) 754-2622 or via e-mail. We take every personal injury case on a contingency basis which means that you don't pay any attorney's fees unless we recover compensation for you. While I enjoy the pleasure of serving clients from all over the Bay Area, my clients mainly come from Antioch, Brentwood, Pittsburg, Oakley, Concord, Martinez, Pleasant Hill, Walnut Creek, Oakland and San Francisco.